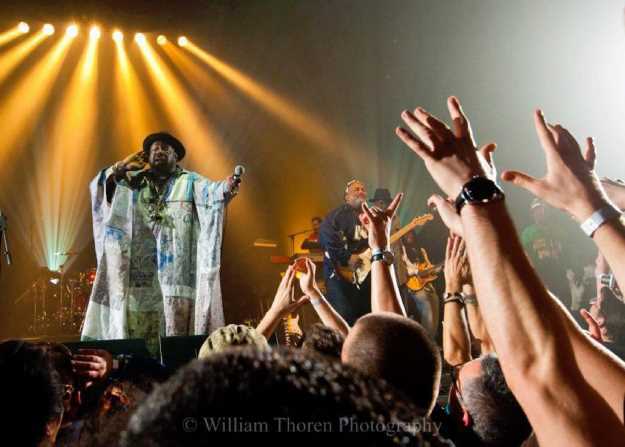 At nearly every turn, whether he's walking by a television, near a radio or video game, George Clinton is reminded of just how big his musical footprint has been. He's also reminded that he hasn't gotten paid for much of what he is hearing. At first it upset him, but then it rekindled a fire in him to fight for what was his, and to reinvent himself again artistically speaking. He released his first new studio album in 38 years last year with "Medicaid Fraud Dogg," which was critically acclaimed. Clinton said in a telephone interview that his recent court battles over copyright and money owed him, and constantly hearing his music being sampled by other artists, woke up the dog in him, so to speak. "That gave me the inspiration to write some new stuff as opposed to giving up. We've been selling out all over the place and those things have helped me fuel. "It gives me the energy to actually fight." He and his legendary band the Parliament Funkadelic will be onstage Saturday night, Dec. 29, at The Signal. Clinton became interested in doo-wop while a teen in the early '50s. He formed The Parliaments in 1955, rehearsing in the back room of a barbershop. The Parliaments released two singles during the next 10 years. They finally had a hit with the 1967 single "(I Wanna) Testify" for Revilot Records, but the label ran into trouble and Clinton refused to record new material. He decided to record the same band under a new name: Funkadelic, founded in 1968. While Funkadelic was psychedelic rock, The Parliaments played funk, blending influences from James Brown and Sly Stone with freaky costumes and themes inspired by the '60s acid culture and science fiction. By 1970, Clinton had regained the rights to The Parliaments name. He then signed the entire Funkadelic lineup to Invictus Records as Parliament. That group scored a Top 30 hit in 1971. Clinton discontinued the Parliament name for awhile, but later in the '70s recorded both as Parliament and Funkadelic. Since then, dozens of musicians have played with the collective that is Parliament Funkadelic. Several have split off to solo careers; others regrouped into smaller bands. Clinton and 15 other members of Parliament Funkadelic were inducted into the Rock and Roll Hall of Fame in 1997. In 2004, Rolling Stone ranked Parliament/Funkadelic No. 56 on its list of the "100 Greatest Artists of All Time." In 2002, Spin ranked Parliament/Funkadelic No. 6 on its list of the "50 Greatest Bands of All Time." He said the band is as tight as it has been in years. He also said all of the recent films and documentaries about not only his career but of other artists who have been influenced by or crossed paths with Clinton and P-Funk have caused him to relive much of his career. "I had to because of all the interviews and documentaries. Like 'Straight Outta Compton,' I had to revisit that music. They keep putting out different movies, and even that Northern Soul (reissue) stuff in Europe is making me revisit it. And going though the courts, of course. I'm getting a lot of them [songs] back." Does it make him proud to look back at his career? "Oh, yeah. Oh, yeah. I'm a songwriter at heart, so it's great to see these young kids redoing my songs. Not just sampling them, but covering them." Where: The Signal, 1810 Chestnut St.